Pan fried noodles are a popular dish throughout Asia, as they provide a starchy base for meat, vegetables or other toppings. Pan fried noodles are rich in carbohydrates and high in calories, so they're not ideal for all diets. Additionally, pan fried noodles are high in sodium and cholesterol, so if you have special dietary needs, avoid this dish or eat it sparingly. Pan fried noodles are calorie-dense, as a 4 oz. serving of 300 calories. That amount comprises 15 percent of the daily suggested intake of 2,000. If you're trying to lose weight, consuming pan fried noodles may not be ideal; it would take 31 minutes of jogging or an hour and 22 minutes of weightlifting to burn 300 calories. 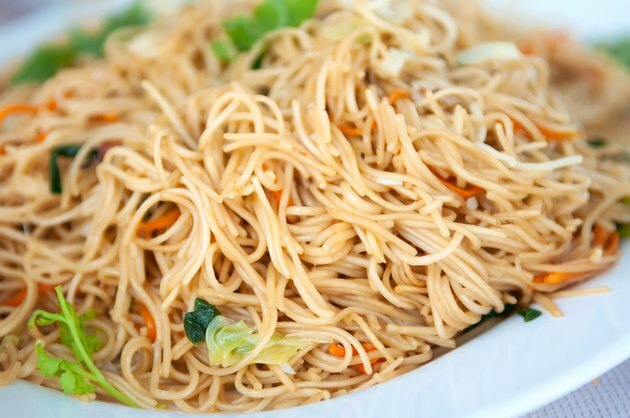 Most of the calories in pan fried noodles come from carbohydrates. Each 4 oz. serving contains 62 g of carbohydrates, which is nearly four times the amount in a slice of bread. Carbohydrates are your body's primary source of energy, so eating high-carbohydrate foods may be beneficial before exercise. Pan fried noodles provide a moderate amount of protein, but it isn't a protein-dense food considering the high calorie content. Each 4 oz. serving contains 10 g of protein, which is just 2 g more than a cup of skim milk, which contains 80 calories, provides. Your body needs protein to build and repair muscle and other body tissues. Pan fried noodles are not deep-fried, so they aren't very high in fat. A 4 oz. serving of pan fried noodles contains 2 g of fat. According to the Institute of Medicine, consume between 20 and 35 percent of your total calories from fat for optimal health. Despite the high carbohydrate content, pan fried noodles aren't very rich in fiber. Each 4 oz. serving contains just 1 g of this nutrient, which provides satiety, promotes digestive system health and can help control cholesterol and blood sugar levels. The daily recommended intake is 25 g for adult women and 38 g for adult men. Pan fried noodles are high in sodium. Each 4 oz. serving contains 350 mg of sodium, which comprises 15 percent of the daily recommended intake of sodium. Too much sodium may increase your blood pressure. Each 4 oz. serving of pan fried noodles contains 55 mg of cholesterol. According to the National Heart, Lung and Blood Institute, consume less than 200 mg each day to limit your risk of heart disease. Pan fried noodles aren't a robust source of nutrients, but they do provide some vitamins and minerals. Each 4 oz. serving of pan fried noodles contains 25 percent of the daily suggested intake of iron and 2 percent of the daily suggested intake of vitamin A.